Zephyr (sail): The Original "Slogger"
WIRED Magazine is really on a roll lately in regard to the intersection of sailing & Blogging (with a capital "B"). Only now there's a new term for us folk (who blog about sailing or blog while sailing or...) - get this we're "sloggers." Love it! 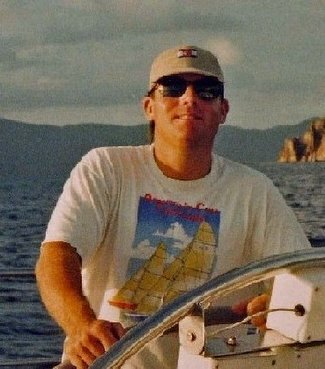 Read about slogger Peter Jensen (and wife Sally) who have lived on a 39-foot sailboat (a Freedom cat-rigged ketch) for nine years in Mexico. They sold their house in Sacramento, California, along with her florist shop, her white 1990 Toyota 4-Runner and his yellow 1974 VW Thing. They abandoned the dirt life (life on land) and moved onto Hopalong , named after Sally's childhood TV hero, Hopalong Cassidy. "Writing and reporting the blog has been wrapped around maritime matters, such as rebuilding the devilishly unreliable marine toilet on our boat (call me the "prince of potties") and climbing the five-story mast to replace light bulbs. But like some cyber dope fiend, making my connection to the internet consumes me. When you move from place to place in a foreign land, the ease of fast broadband connections found in the Old Country (the U.S.) begins to appear a fantasy." Great to run across David's writing in Zepher and link to his photo and story in Wired. Thanks Zepher. David and Sally are relatives of ours who visited us onboard Wings in Sausalito in 1996 before they bought Hopalong. Thanks for the mention. Not a biggie, but David is my first name. Peter is my land-locked brother although he took up surfing at age 58 in San Diego and is still at it at age 70.